Rustic barn weddings are very popular, especially in the fall. Such a special venue calls for just the right type of decorations. They should be pretty enough for a wedding, yet casual enough to suit the location. 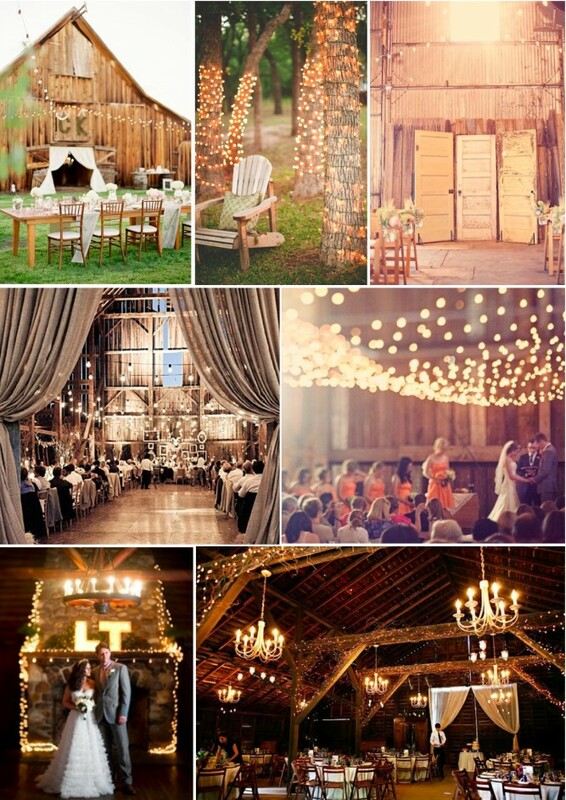 These are some wonderful ideas for pretty rustic barn wedding decorations. Great lighting can be one of the best ways to dress up a barn. The big open space can feel a bit dark if not properly lit. Lanterns are one of the best styles of lighting for a barn. Fill them with tall pillar candles in either ivory or your wedding colors for a great effect. Lanterns can be used as centerpieces, hung from rafters in the barn, or set out around the perimeter of the space. Another fantastic lighting idea is to hang strings of globe lights around the rafters of the barn. You can also use dozens of tiny round glass candle holders filled with votives to suspend over the dance floor. They will create a romantic flickering light that will dance on your bridal jewelry. Flowers are always an important part of a wedding, and there are many varieties which are well suited to a rustic venue. Traditional flowers like roses, lilies, tulips, and orchids tend to look out of place in a barn. The best choices are casual blossoms with a country feeling, such as sunflowers, mums, dahlias, and craspedia. For an interesting kick, incorporate non-floral accents into bouquets and centerpieces. Dried seed pods, wheat, cattails, and grapevine are all great choices. Tie up bouquets with a wrap which has that same country flavor. A piece of gingham check ribbon, some raffia, or a band of slubby dupioni are some examples. As for the centerpieces, why not display them in rustic vessels? Fun ideas include oversized galvanized tin pails, watering cans, wooden boxes, or even carved out pumpkins. If your wedding ceremony is to take place inside the barn, an aisle runner would be a nice touch. After all, when you walk down the aisle in your dream gown and special bridal jewelry, you don't want to have to worry about your train snagging on rough wooden floorboards! For an ultra-casual look, make a white canvas runner edged with burlap. You can make it unique by stenciling a design on it in your favorite colors. Or use a simple white cloth runner and dress it up with seasonal flowers in baskets placed in intervals along the way. Create little autumnal tableaux around the baskets using gourds, pumpkins, and candles in lanterns for a beautiful aisle decoration. Wreaths always look fantastic for a barn wedding. They can be made from a number of different materials to fit in with the rustic theme. A wreath made of wheat tied with a satin ribbon creates a look of understated rustic elegance when hung on a barn door. Dried flowers make for romantic yet rustic wreaths. They would be lovely hung on the wall behind the head table. A cute idea is to suspend tiny wreaths of lavender or herbs on the backs of the bride and groom's chairs. They will smell as wonderful as they look. It is the type of little extra which will add a lot of character to your wedding reception. A rustic barn wedding is one of the most fun to decorate. The casual and unique nature of the setting allows the bride and groom a lot of freedom to use the colors and decorations which best suit their personal taste. As long as you keep the decor relaxed, it will be perfect.